an astronomy club member who joined for love, properly confessing to the outgoing president. Character designs are clean and straightforward, and several popular seiyuu are involved. Notably, everyone we meet is fairly “normal” as far as high school archetypes are concerned; though we don’t meet everyone in this first outing, so some weirdos may yet surface. 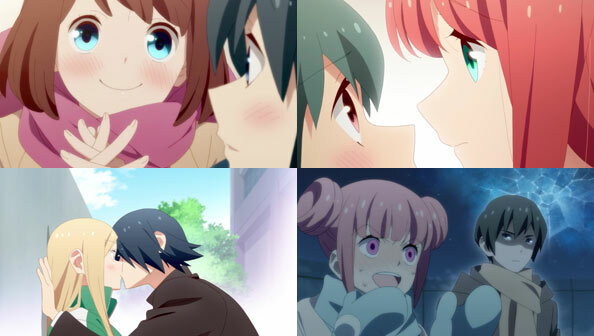 As a 4-koma based sequence of little stories about all the different scenarios of young love, TC is the definition of “okay.” It’s not unattractive or inoffensive, but it’s hardly groundbreaking must-see anime. More of an appealing snack than a feast. I love the manga, although it’s getting a little dragged out due to its popularity. The weirdest weirdo is probably Love Master, and he’s in the OP, so stay tuned as they say.